Rosco zpětné zrcátko z leštěné nerezové oceli (rameno v chromu) 1ks. Průměr je o něco větší než model USA (11.3 cm) a kulatý tvar je rovnoměrnější. Výhodou oproti americkému modelu, jej lze osadit, díky pohyblivému kloubu v horní části, jak vlevo tak i vpravo. Doporučujeme. Rosco mirror polished stainless steel each. Rosco The exterior mirror is similar to the round mirror American t / m 7/1967 at which the hinge is attached. The diameter is slightly larger than the USA model (about 11.5 cm), and the shape is more uniform. 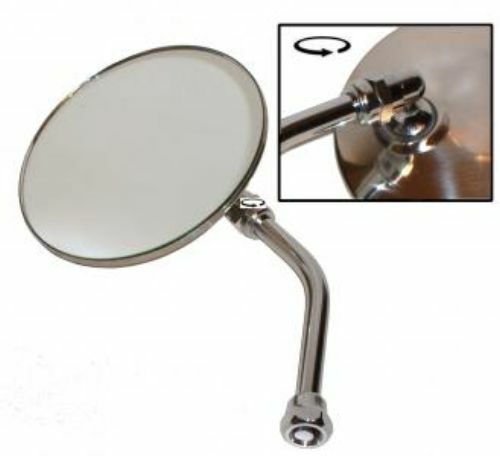 An advantage over the American model is that Rosco mirror is both left and right to assemble. The back is made ​​of polished stainless steel while the arm is made ​​of chromed steel. The Rosco mirrors are individually furnished.